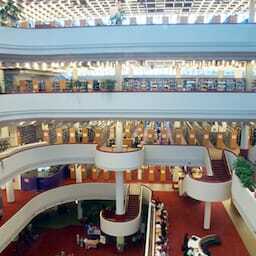 One of my favourite places to visit in Toronto is the gorgeous Toronto Reference Library just north of Yonge & Bloor. I’ve gone a handful of times to work there with my laptop, and every time, just like everyone else, I snap a couple photos with my iPhone thinking to myself that I should eventually return with my camera to take some better photos. And then just yesterday after going to Taquería for lunch once more, I again headed to the Reference Library with my camera. This time I wasn’t stopped by anyone, in fact, a member of the library staff smiled at me and encouraged me to take more photos from a different angle as well… Hm. So I’m not sure they’re totally clear on what their policy is on photography at the library, but I hope to get a clear answer soon so I can return with my camera and take some more (and hopefully better) photos there. it’s truly a gorgeous place! 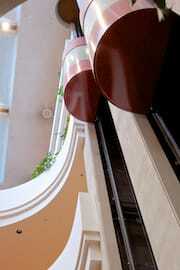 What a gorgeous place, no? I love Toronto! Toronto Reference Library was published on Wednesday, August 14, 2013 at 2:52pm EDT by Daniel Menjívar and last updated on April 11, 2018 at 9:30pm UTC .